I can see myself clearly – walking into the yoga studio for class – anxious to get there early so I could get my spot. Time and time again, I was always frantic and panicked the whole walk over at that thought of not being in that particular place. I needed to get that spot. It was – in my mind – the only place in the room where I couldn’t be asked to move: a little crook in the wall ensured my safety. I figured out that from only that particular spot I couldn’t be forced to move backwards, forward, or sideways thanks to the configuration of the room. Not too far to the back or too near the front of the room, my placement felt ideal. If the teacher came in and asked us to move and make space for others, I would be exempt. I wouldn’t have to move or interact with anyone else. I wouldn’t have to change or give anything up. I could just be there and block the rest out. That was exactly what I wanted. More often than not I would sneak into the room before paying for class, hastily throw down my mat and take a momentary pause of relief before heading upstairs to sign in. Relieved that I had secured my spot. I needed to be stuck in that spot. That was as much as my brain and being could handle at the time – any other option meant the potential for interaction that I didn’t want. I wasn’t aware of it then but any one of those interactions would resurface trauma and I would unconsciously be right back in it all without knowing. No. I didn’t want to tolerate that any more. I wanted to protect myself. I just wanted my spot and my class and that’s it. Was that too much to ask? Sometimes it was. Sometimes, no matter how early I got there, someone else was in my spot. In those times my already heightened state would tip over even more strongly as my entire body from head to throat to shoulders to heart to stomach and below would shift to a state of high alert mixed with emotion. Fight. Flight. Freeze. All at once. All was lost. That spot held me. Supported me. Let me cry. Could I trust the other spots in the room to give me the same? No. No I couldn’t. Begrudgingly and with my simultaneously depressed and heightened manic states intertwining and escalating, with one part of me trying to turn and run out the door, the other part forcing me to stay and trying to not cry, swallowing emotion, I searched the room for another place to be. When I finally settled on a new space, I would be on guard and at full attention, protecting my area with fierce eyes, internalized anger, and energy, lest the teacher should ask me to move (trying to will that they wouldn’t with my thoughts). All the while eyeing “my spot” and feeling another flurry of thoughts cut through my head like a chainsaw at not being in it. What I didn’t realize then was that every time I had to find another place, I could. I did. And it was okay. There was support in the room to do so. Nothing fell apart. Nothing bad happened. I could walk a few paces forward, backwards, over, place down my mat and practice in a different place. As we moved through the class, my desire to be in “my” spot disappeared (sometimes quickly, sometimes it took a while for my brain to let go – to unstick) as did my protection of the new one. I wanted to be stuck, internally attempted to will the ability to stay stuck to that spot no matter what and, as it turns out, I could also move. I could also adapt. Even though I didn’t believe I could. Even though it felt painful and uncertain at first. In the beginning I only moved if I was forced to. I resisted unsticking fiercely. At the same time a tiny wee part of me started to grow that wanted to unstick. Even if I couldn’t trust it or allow it to surface too much, no matter how small, it was there. I was learning – without even knowing I was – by allowing myself to take up the arduous task of moving in the room to another spot and discovering that it was safe. It could be safe over here or over there too. I could move over here too. I could find movement in new places literally, physically and mentally. The aversion to being “forced” to move by others (who didn’t know the spot was “mine” to begin with) eventually gave way. I could trust myself and know that I could handle moving. In time, it was no longer painful and no longer a sacrifice to lose my spot. I didn’t need to stay stuck. My feeling of safety grew as I unstuck and my brain and body no longer entered the room in such a heightened state. I started to purposefully place my mat down in different places – noticing the blip of anxiety that arose each time. I consciously decided to make it a part of my practice. I would smile at the other people in the room instead of try to stare them down out of fear. More and more openness and inclusivity took root as I became less stuck. Lately I’ve noticed that when I walk into the studio (or any studio) I don’t even think about where I put down my mat. I don’t have a spot and I don’t look for one to have. I want to talk to the other people in the room. I smile without even noticing I am. I feel easeful without a hint of those previous heightened states. The flexibility that has come from this practice translates into life as well as I find myself exploring different and new relationships, ways of being, and activities. Lately I’m often living outside of my “routine” on any given day. For months, every time I’m somewhere I usually never am in the city I run into someone I know. I’m amazed every time and smile deeper and deeper with each chance encounter, feeling encouraged by the universe to continue unsticking and keep doing things and going places I normally wouldn’t. Continuing to move away from my regular spots while feeling safe, happy, engaged, and alive by doing so. As I can see so much change and growth and unsticking in so many ways I am aware that there is more stuck. For example, a few months ago my brain and being were stuck on not moving a class I’d been offering for over a year (at the same time and on the same day). Much like trying to protect my spot, I had been trying to protect the class since I started offering it, worried that it might not stay on the schedule if not enough people came. Even though it wasn’t “mine” I now wanted to also protect it both for myself (so I could keep teaching) and for everyone else: for all the students who came. The question of moving the class came up, and along with it so many fears that had been embedded in my worry and protection, convinced that no one would come if it changed. Many of those same attributes of emotion and heightened sensations from years ago surfaced throughout the conversation about whether to move it or not. And, in the end, I wasn’t ready to be unstuck. I wasn’t ready to move a few steps in any direction. I was fearful and wanted to stay stuck. Even as I closed the door at that time, the possibility of moving was introduced – another seed taking root. From that possibility, just the other week, I was ready to unstick. 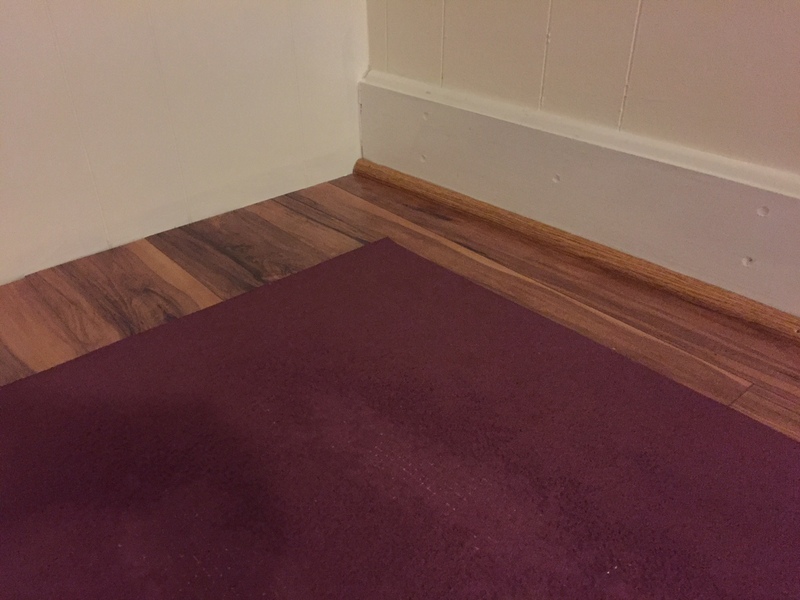 I was ready and eager to change the class and I started to see that just like picking up my mat, I could also pick up and teach anywhere, any time. I didn’t need to protect it. Even with those realizations, throughout the conversation, it was still painful through my heart center to allow the unsticking to occur – to move the class by an hour or so. Throat closing, heart closing, brain scattering and trying to compute and calculate the safety of doing so. To walk through the fear that no one would come and trust that they will. Then the decision was made, I walked through, accepted the change, and within moments found relief. Not only was I no longer stuck, the quick fierce emotion that surfaced had released and I felt amazing knowing that I had emerged on the other side of unsticking. Knowing that everything will be more than okay. Though I crave change and “unsticking”, right now I actively resist it at the same time. It will be interesting to see how to continue to work with (and move beyond?) such a significant sticking pattern. How to not always be stuck in seeing things through the lens of trauma or post-trauma. It’s not to erase or remove anything at all. I valued and needed to be stuck in those ways at those times and now I can move through life differently (and to be stuck in any ways I’m not yet aware right now). It’s a practice. Through that practice, I’m learning to place my mat down anywhere I go with trust; to step backwards, forwards or to the side and still find movement; to be met with safety and connection every time I move off my regular course; and to be able to pick up that mat again (and again and again) and know that not only will I be okay; my un-stickiness will continue to grow and I will continue to move in new ways inside and out.